People naturally like to carry and wear stones connected with their zodiac sign, and at Mimosa we’re often asked which stones are connected with which sign. I’ve tried to find definite information about the subject, but keep getting lost in a muddle of expert disagreement. Then when I’ve asked people who really know their astrology and crystals to please clear things up, they throw up their hands and say “Don’t ask me!” So I set out to find out not only the connections between crystals and astrology, but the reason for all the confusion. Part of it seems to be the very antiquity of the subject. The earliest stone/zodiac list I know of was written by Josephus in the First Century, using the Breastplate of Aaron as reference, and there’s no reason to assume this list was the first. Many writers since then, from bishops to alchemists, have taken a shot at the subject. The waters only get muddier when we get to the 1800s, when spiritualism sparked popular interest. Geology itself has changed through time. Knowledge about how to identify and classify stones has grown considerably, along with cross-cultural knowledge. Even in a single culture and time, stones often go by various names. When you throw in variations of time and place, it becomes clear that everyone isn’t always talking about the same thing. Just as an example, think about quartz: An ancient Greek priestess, who used quartz to focus the suns rays for an altar fire, would have quite a different view of the stone from her Roman counterpart, who believed quartz to be an ultra-hardened form of ice! 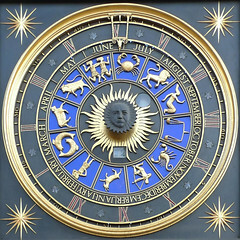 To see how this confusion affects astrological correspondences, let’s consider Virgo. Checking the conclusions of six authors through the ages, from a medieval cleric to Aleister Crowley writing in the 1950s, we find five different choices corresponding to Virgo: chrysolite, corallite, carnelian, peridot, and emerald (with only emerald getting two votes.) Green stones seem to have the edge, but other than that this list seems a bit random. Virgo, as sign of green corn, could have the apple-green chrysoprase, chrysoberyl, which is the same colour, or green feldspar, which was associated in ancient Egypt with fertility. If thought of as a sign of purity, diamond or an uncoloured chalcedony would be required. But since ripe corn is also a suitable colour for Virgo, one could use light brown agate or onyx. Is it just me, or are we not now more confused? Practically speaking, the best we can do is to settle on a relatively simple, short list, using birthstones and color correspondences as guidelines. The list we use at the store gives 3-5 choices per sign, which should give any of us a reasonably good choice of semi-precious stones to complement our birth sign. And if this sounds a little bit like “That’s my story and I’m sticking to it,” maybe it is!